is located in the heart of Lake Country and serves all of Southeastern Wisconsin, we have certified professional land surveyors on staff as well as highly skilled field technicians. LandTech has over 40 years of combined experience and is able to provide a wide range of surveys to meet our client’s needs. We stand behind the accuracy and the quality of our work. We will tailor our survey to meet your individual needs, making certain our clients are satisfied with the final product. Every survey we produce is completed with our stamp of approval. 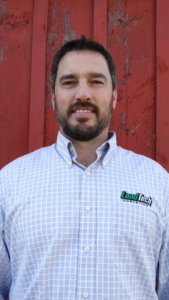 John began his surveying career in 2002 as a Field Technician with LandTech Engineering. He learned the fundamentals of measuring land accurately alongside his crew chief. John promptly advanced from field technician to Survey Crew Chief, working under the guidance of a professional land surveyor and mapper. He oversaw a two-man survey crew responsible for gathering measurements in the field and generating that info into boundary surveys, plat of surveys, subdivision plats, etc. A great deal of time was spent on construction staking for new subdivisions including laying out lots, road, and utilities. During this time, John found a sincere appreciation for the development process. While Johns love for the outdoors correlated well with being a Crew Chief, he could not pass up the opportunity to advance his career when the promotion to Office Survey Manager was offered to him. John became proficient at drafting survey maps and engineering plans using AutoCad. As Survey Manager, John was responsible for managing all field and drafting projects including ALTA/NSPS surveys, boundary surveys, Certified Survey Maps, foundation surveys, topographic surveys, subdivision plats, condo plats, construction staking, road and utility plans for residential and commercial projects. Although working as a Survey Manager was rewarding, John strived to work his way up the ladder. He studied countless hours for the Wisconsin Professional Land Surveyor’s licensing exam, and passed the two-day exam on the first attempt. John was granted a Professional Land Surveyors license in the State of Wisconsin on July 29th, 2009. Becoming a Professional Land Surveyor opened the door to bigger and better opportunity, fulfilling his dream of becoming an entrepreneur. In 2010, John bought the business that he had worked so hard for during the previous 8 years. Since 2010, John has seen consistent growth in his business from year to year. He found out quickly that he needed to expand the company to keep up with the demand of his clients, therefore adding full-time personnel in the field and office. John is married and has two sons. They live on a hobby farm and enjoy doing just about anything outdoors. John is a member of the Wisconsin Society of Land Surveyors, National Society of Professional Surveyors, Society of Southeastern Wisconsin Land Surveyors Chapter, Metropolitan Builders Association, Wisconsin Builders Association and the National Association of Home Builders. John has been a volunteer for the Waukesha/Oconomowoc Ducks Unlimited Chapter since 2007 and served as the Chapters Chairman from 2010-2012. 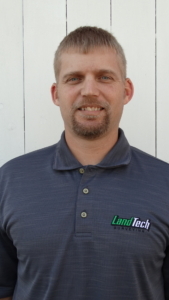 Now that you know a little about John and his company, his hope is that you will give LandTech an opportunity to serve you with your land surveying needs. LandTech has seen consistent growth due to the loyalty of their clients and a referral network that speaks for their customer service. We will provide you with services in a timely and accurate manner while staying cost effective, while using the latest field equipment and surveying software to ensure the client has quality results. LandTech Surveying strives for professionalism and a commitment to long-term relationship. Matt is a Professional Land Surveyor licensed in Wisconsin with 17 years of experience in a wide variety of Land Surveying projects. Matt graduated from Madison Area Technical College in 1999 with an Associate Degree in Civil Engineering Technology. He has been responsible for completion of many types of surveying projects including topographic surveys, Certified Survey Maps, Plat of Surveys, easement exhibits, legal descriptions, ALTA/NSPS surveys, control surveys, public utility corridor right of way, 3D laser scanning and construction staking projects. Matt also has experience in subdivision plats, right of way platting, United States Public Land Survey remonumentation, mobile LiDAR collection and mapping, and drone survey projects. Over the past several years Matt has been responsible for survey crew coordination, survey mapping staff, and client coordination involving construction staking schedules and delivering boundary surveys. He currently serves as the State Coordinator for Trig Star for the Wisconsin Society of Land Surveyors (WSLS) and is a Past President of the Milwaukee Chapter of the WSLS. Matt enjoys spending time with his wife and three children and resides in Hartford, WI. Matt is a 20-year veteran of Rock River league baseball and rounds out his free time with some hunting, fishing, and summer watersports on the lake. 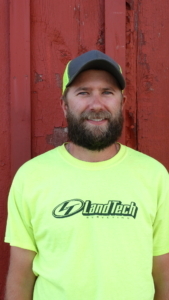 Jake is our Survey Crew Chief here at LandTech Surveying, LLC. He is responsible for managing and completing the field work for projects including Boundary Surveys, Topographic Surveys, Construction Staking, Plat of Surveys, Elevation Certificates and more. 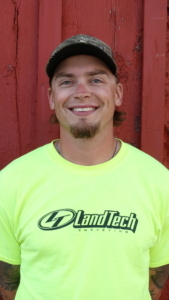 Jake has been a part of the LandTech team since March 2014. He is working his way towards earning his Professional Land Surveyors license in the future. Jake is a member of the Wisconsin Society of Land Surveyors (WSLS), National Society of Professional Surveyors (NSPS) and the Society of Southeastern Wisconsin Land Surveyors Chapter. He is also a current committee member and past Chairman of the Oconomowoc / Waukesha Ducks Unlimited Chapter. During his free time Jake enjoys spending time outdoors hunting, fishing and camping with his wife and two dogs! Jake has been playing ice hockey for 17 years and enjoys playing softball a few nights a week during the summer months. years as a Marine Corps Infantryman with three overseas deployments. After his honorable discharge he attended Fox Valley Technical College and graduated in May 2018 with an Associate Degree in Natural Resources along with certificates for Forest Management and Land Use and Habitat Management. While attending school he spent his free time volunteering with Winnebago County Land and Water Conservation Department, assisting conservation technicians with GIS observations and comparisons, topographic surveys, and basic design with AutoCad. Tyce is working closely with Jake to gain knowledge and more field experience doing Boundary and Topographic surveys, Construction Staking, and Plat of Surveys. In July 2018, Tyce passed the National Society of Professional Surveyors test to become a Level 1 Certified Survey Technician. In his free time Tyce enjoys the outdoors, hunting, fishing, kayaking, and hiking. He volunteers for a program called SnapShot Wisconsin which is a DNR run program set up to help monitor the elk herds near the Black River State Forest. 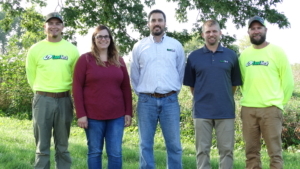 Lori is the Office Administrator at LandTech, she joined the team during the summer of 2018. You will find Lori handling the receptionist duties in the office, updating our social media platforms, as well as many other administrative tasks. 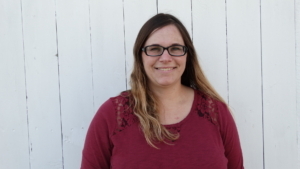 Lori has experience with teaching agriculture at Joliet Junior College, Consumer Loan processing at the Sugar River Bank of New Glarus as well as Loan Program Technician at the USDA Farm Service Agency. She also currently owns and operates Cri-Lo Farm, where she raises beef and pork with her husband, Chris and 5 children. She enjoys spending time outdoors with her family on the farm, gardening, volunteering with Waukesha County 4-H and cooking.